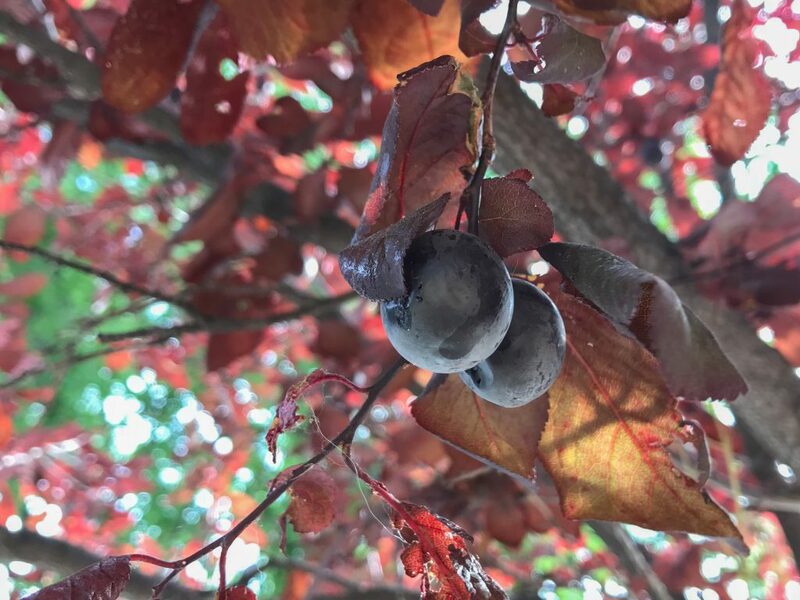 This was a great year for stone fruits in Santa Fe, and I harvested a lot of plums both from street trees and in the wild. Most people don’t seem to realize that the purple-leaf plums planted as landscape trees produce very tasty fruit. Maybe they don’t see the plums, because the color of the fruit blends in with the color of the foliage. Maybe most people are frightened of unfamiliar foods. Whatever the reason, unappreciated fruit was falling to the ground all around my neighborhood. Backyard Forager to the rescue! I juiced the fruit, canned the juice, then made fruit leather from the pulp. It’s only now, in the downtime that is winter, that I’ve had time to play with the juice, and I’m really happy with the results. This wild plum mousse is not only delicious, but versatile. You can serve it in individual dishes or make one big, tasty pie! I’ve tried this recipe with plum juice and grape juice, and both are excellent. I bet it would work wonderfully with the juice of any wild fruit (prickly pear is next on my list!). You’ll want to adjust the sweetener, depending on the fruit you use. Most recently I made it with artificial sweetener, and the flavor was great. If you want to play around with liquid sweeteners like honey, maple syrup, or agave nectar, please let me know how that works! 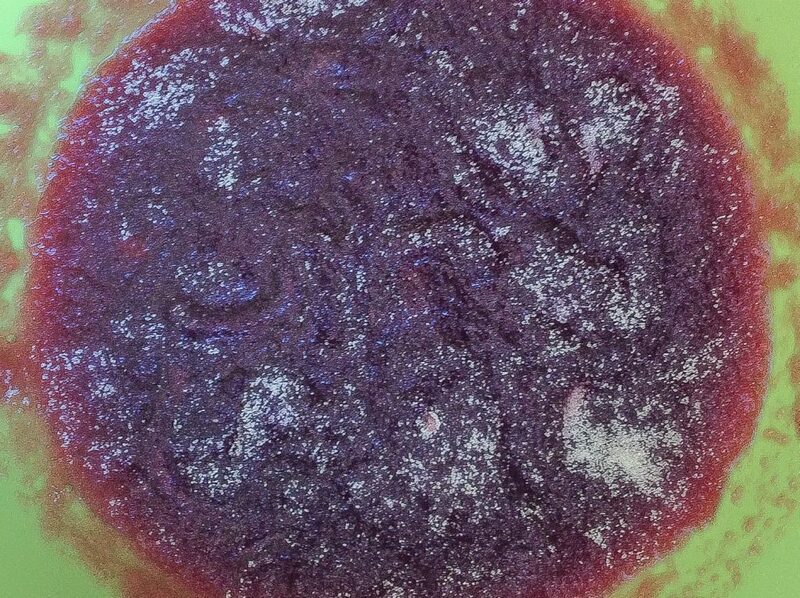 Sprinkle the gelatin onto 1/4 cup cold plum juice and let it bloom for five minutes. The gelatin has fully bloomed when the surface of the juice looks solid and wrinkled, and very few gelatin grains are still white and visible. It should take no more than five minutes. While the gelatin is blooming, heat the remainder of the juice in a sauce pan, whisking in the sweetener, lime juice, and salt. Taste the juice and adjust for sweetness if needed. Add the bloomed gelatin to the juice, and whisk over low heat until the gelatin has dissolved. This should take 2-3 minutes. Test by rubbing a little bit of juice between your fingers. If it feels smooth, the gelatin has dissolved. Transfer the juice to a large bowl, cover, and refrigerate for 3 hours or until the gelatin is softly set. Transfer the softly set gelatin to the bowl of a stand mixer and add the egg white. Beat on high for five minutes. The juice will almost double in volume and the color will become much lighter. This is your mousse. To make a pie, pour the mixture into a graham cracker crust and move it to the refrigerator for an hour or two, until the mousse has set firmly. Before serving, top with a layer of whipped cream, or decorate it with perfectly placed pieces of fruit. 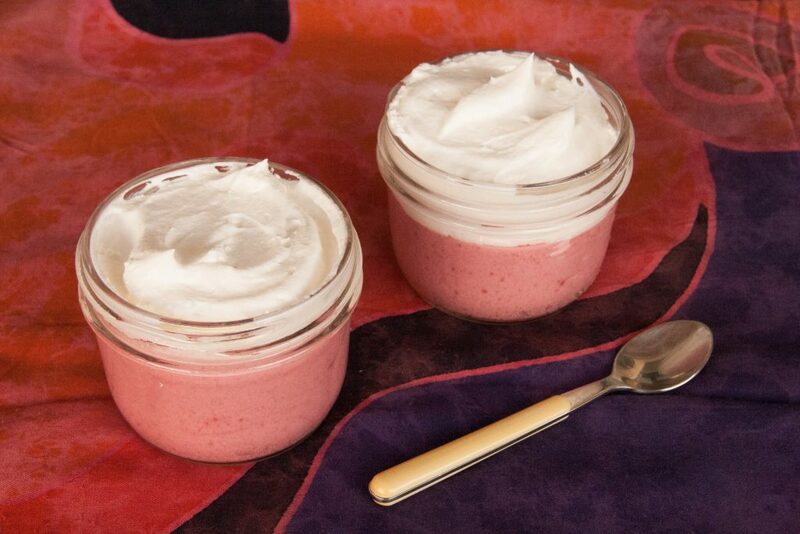 To make individual, low carb servings, spoon the mousse into individual dishes, topping with whipped cream. If you’re feeling fancy, use parfait dishes and create alternating layers of mousse and cream. This dessert is light, fluffy, and full of flavor. I like it best served with a thin ginger snap (or two). The crunch of the cookie emphasizes the airy, creamy texture of the mousse. Ellen Zachos is a forager and horticulturist who is passionate about wild food and drink. Mini Wild Greens Quiches: Crustless & Low Carb! So yummy! Thanks for bringing it for dessert. I couldn’t even taste the artificial sweetener. Delicious! Looks good. I’m only familiar with P. americana. Are these plums sweeter? What’s their name? Hi Alan! The street plums I harvest are mostly Prunus cerasifera. I’d say they’re more sour than traditional, store bought plums, and about the same (maybe just a teeny bit sweeter) than P. americana. Subscribe to My Award-Winning Blog! Enter your email address and I'll send you notifications of new posts.